Shop no. 2&3 , Siddeshwar udyog nagar , opp. Avdhoot ashram , near NH-8 , nallasopara , vasai Taluka . February 25, 2013: Chennai-based tyre major MRF has launched its range of premium all-terrain tyres, the MRF Mogrip family -- the Meteor M, meteor and Moto-D. 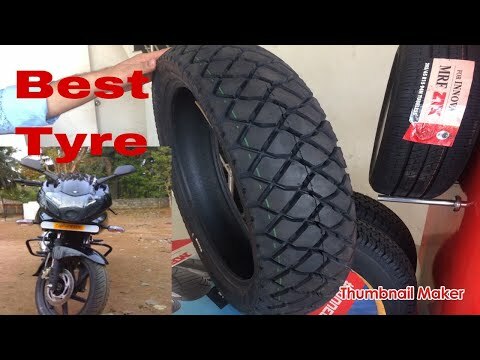 These all-terrain tyres are designed to be shod on present-day motorcycles with their geometrically styled directional tread pattern, using advanced tread compounds. The company says the road-hugging carcass shape keeps the bike steady on-road while offering complete off-road control. While the centre blocks provide stability in straight riding, reducing irregular wear, the shoulder blocks are useful when the bike is being cornered. The tyres also provide good stability in wet conditions. There are 8 sizes available under the three designs. Moto D comes in 4 sizes (100/90 17, 3.00 18, 2.75 18, 3.00 17), Meteor in 2 sizes (100/90 17 120/80-17 and 100/90 18) and Meteor M also in two sizes (3.00 18 and 3.00 17). The Mogrip range is are available with all MRF-authorised dealers across India with a few stylised sizes being exclusively available at the flagship MRF Tyres & Service Franchise Stores and MRF Exclusives.